Due to its long history the Kaiserhof is deeply rooted in Muenster. In 1895, it was built by Oskar Försterling. The Kaiserhof had five floors. An additional wing towards the Achtermannstraße had a sixth floor, where the staff was housed. Around 1930 the hotel was sold to Josef Cremer. The steel trader, who at that time led the ‘Thier Brewery’ in Dortmund, leased it to Konrad Teerling, the son-in-law of Oskar Försterling. He primarily ensured that the house became one of the most famous in Muenster. Only the popular coffee house orchestra played in the former "Concert Café ". There was a large dance floor and in the summer, the dance floor in the garden could be used too. A good dining facility was the "Tunnel", a home-style pub in the basement. On September 12, 1944, bombs hit the Kaiserhof. Within seconds it was almost completely destroyed. Only the "Tunnel" and a part of its kitchen withstood the bombs. From June 1945 until well into the 50s the Kaiserhof was rebuilt slowly. With the participation of the employees and the tenants five floors, a restaurant and café were built by and by. The garden and wing gave way to the now more modern style. Over the following years the Kaiserhof was home to a variety of - sometimes illustrious - guests. Most remembered is King Ibn Saud, who visited the Kaiserhof twice – in 1964 and 1965. The former Saudi king stayed for two weeks and rented a whole floor of the house. He was reported to be in Muenster for treatment in the University Hospital. The king always traveled with a large entourage and security staff and distributed a very generous tip e.g. to the page boy, who drove the limousine. He also gave the tenant Konrad Teerling a saber with gold shank and a jeweled dagger of gold. These gifts were long considered lost, as they were sold by his son. Richard Koch, owner of a pawn shop on the Bahnhofstraße had acquired them and hung as decoration in his office. After reading a news report in the daily newspaper ‘Westfälische Nachrichten’ years later he learned that these valuable pieces were from King Ibn Saud. In 2002, "after short and intensive negotiations", he handed them over to Kaiserhof-owner Peter Cremer. 1972 Oskar Teerling, the son of Konrad Teerling, took over the lease as his father decided to go into a well-deserved retirement. The leasing contract expired in 1999 and Anne and Peter Cremer – the great-great-grandson of Josef Cremer - took over the management of the hotel as the first owner ever. Under their leadership a nearly ten-year-long renovation and modernization phase began in 2001. Gradually, all the rooms and bathrooms were renovated, windows with quadruple glazing installed, meeting rooms and public areas like a fireplace room and a modern lobby newly built. In addition, air conditioning was installed in all rooms, meeting rooms and public areas. Then the exterior façade was modernized. The interior design was supplemented by selected antiques and art objects - including original paintings by Busch, Haase, Determeyer and Modersohn. In 2008, the neighboring building was purchased and the owners opened the restaurant Gabriel's. 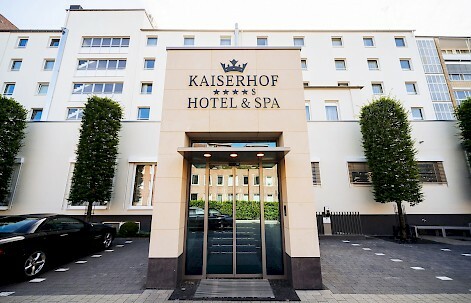 In the spring of 2011, the last section was completed: the opening of the Kaiserhof Beauty & Spa. The years of effort have been honored with the appointment as a four-star superior hotel by the DEHOGA (German hotel and restaurant association). On January, 1 2014 Anja and Kay Fenneberg took over the management of the Kaiserhof. Since January, 1 2015 they are tenants of the hotel. In 2016 they startet renovation further parts of the Kaiserhof i. e. the back entrance, the lobby and one whole floor with 21 rooms. More renovations are planned for 2019. Where the journey will go, is primarily determined by the guests. For your requests and suggestions are the signposts for the entire team and the road we will travel.